Basic details — When: February 18 at 9 a.m. Start/Finish: Happy Foot/Sad Foot sign at the northwest corner of Sunset Boulevard & Benton Way in Silver Lake. Approximate time to elapse: 5-6 hours. Total distance: 32.95 miles. 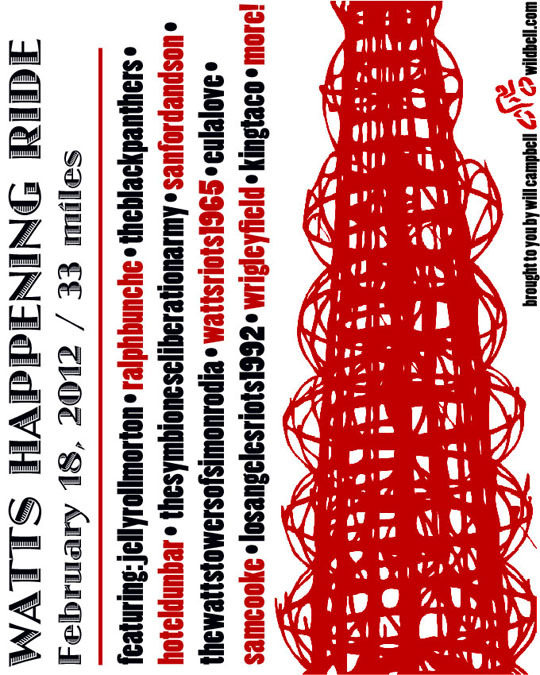 Optional partial ride: If doing the full ride isn’t feasible, consider joining the ride at approximately 9:30 a.m. downtown on Spring Street (anywhere between 2nd & 9th streets) for the roughly 9-mile segment to the Watts Towers. The 103rd Street Blue Line station is near to the towers and can be an alternative to get you back into downtown. The Facebook event page is here. The complete route map is here. This entry was posted on Wednesday, January 25th, 2012 at 8:15 am and is filed under biking, happenings, history, los angeles. You can follow any responses to this entry through the RSS 2.0 feed. Both comments and pings are currently closed.